"The BEST SHOW" creates a new fire show "Bremen Town Musicians"
December 4, 2016 by the order of our ongoing client company “The Best Show” creates a new theatrical fire show dance for children and adults, “The Bremen Town Musicians”. 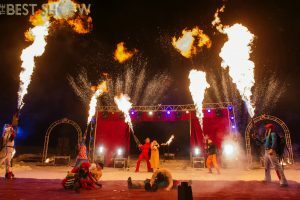 This show gathered all: virtuoso dancing, stunts with fire, acting, more than 400 fireworks products, creative props (hot table, egg, fiery drums, electric guitar pyrotechnics, 5 flamethrowers, fire sand …. i.dr.) Andtheater area with a professional theater with light, sound and fire generators that create the atmosphere of this grand event. As if the theater had come to visit you. Preparation for the event began just two weeks. First, we chose the theme of the show ordered it. It was amazing. We were thinking how to put a fire show for children? And originally we planned children’s fire show “Peter Pan” or fire performance “Aladdin”, but then, listening to children’s songs, the director Xenia Safi, suddenly heard the track “We come to you for an hour,” and realized that the soul asks to put children’s fire show “The Bremen Town Musicians”. And only had to like the idea of the parents of the birthday girl. On the same evening there was a surprising – and called zakazchitsa said -Kseniya, we here with my husband thought maybe “The Bremen Town Musicians” put)) It was a decision … Over the next day had already been selected and arranged the music for the show? , compiled script and work has begun to boil. After all, it was necessary to come up with something very striking and unusual! Creative fire show to surprise children and adults … And then the idea was born of grief drums, electric guitar pyrotechnics, dancing atamansha on the burning table. It was necessary to have time to develop and sew custom-made suits for ten artists! Warm suits. After all, we had to make a fire show in the dead of winter, in the -10 degrees Celsius. In the show a lot of acrobatic stunts performed by robbers, and troubadour and a princess in the third issue of general dancing acrobatic rock and roll, and it was very important to figure out how to keep the artists warm muscles, so as not to injure them. For BEST SHOW – it is not just a fire performance, is a professional, dance, stunt fire performance, where the leading experts in their field. If you are looking for a showthat will surprise and please you very much, your child, and all of your guests, you should feel free to order a fire show from the theater BEST SHOW. After all, you can order the new thematic show, it is suitable for your child, it is your holiday. “Best Show” will develop a show for children in the yard of your home or garden, or forest, or on the shores of the sea … Theater Fire “The Best Show” runs efficiently, quickly and very efficiently. Because we really love what we do! We love to make people happy and vivid emotions! Give your child vivid emotions and your friends!